Mother's Day for me is all about "Ma." She's been filling in for missing mothers in my family for more than twenty years now. As the years have gone on, she's taken on even more "children." Being a mother, is what she does best. She never had a professional career, although she would have made a hell of a teacher / bookkeeper / nurse / psychologist / personal assistant. I know because she's been busy playing all of those roles to an impressive amount of "children" consisting of her kids, grand-kids, great-grand-kids, nieces, and neighbors, for all these years. She isn't a grandmother like ones that you always hear about, cooking big meals from scratch of recipes from the old-country (she prefers the ones on the back of the box), or one with tales from a glamorous past from days long ago. She's sweet and simple, unfussy almost to a fault. She's wise and strong, and has only gotten more so with age, but she's also hysterical, and someone who can make you feel instantly comfortable. If she had a culinary equivalent it would be the Madeleine... even if she doesn't know what they are. Madeleines are little tea cakes that you can serve at breakfast, brunch, tea time or dessert. If you are like me and my Ma, you'll think most times are acceptable for a little something sweet. They are well-known as being associated with Marcel Proust's writings on involuntary memory. (More about that here). However, despite their fancy little shapes and associations, they're actually a snap to make, if you get yourself the proper pan. (I normally wouldn't advocate buying a one-trick pony pan, but these little cakes are great for party favors and all sorts of occasions, that I think you'll get a lot of use out of it). The traditional flavoring is a little lemon zest and vanilla. That is how I normally make them. In honor of Ma, I wanted to try to flavor them with strawberry, which turned out very nice too. The jam I used did nothing to change the color of the cake, so I cheated with a bit of pink food coloring. I know, I know, but pink seemed so much more festive. It was only a drop too. 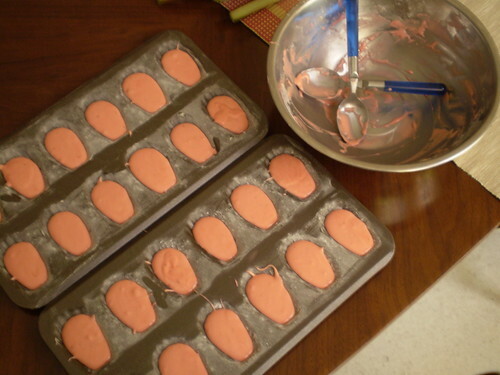 If you can find strawberry extract that might eliminate the need for the food coloring. I checked three stores, but I couldn't find it. I think the flavor from using jam is probably preferable anyways. Bake these and give them out as Mother's Day gifts to friends or family, if you won't be celebrating with your mom. You pretty much can't mess these up, unless you over-bake them, so watch them towards the end. They're a classy choice, making it seem that you went to the extra trouble to think about someone other than yourself. Exactly what the best Mas in the world do naturally. 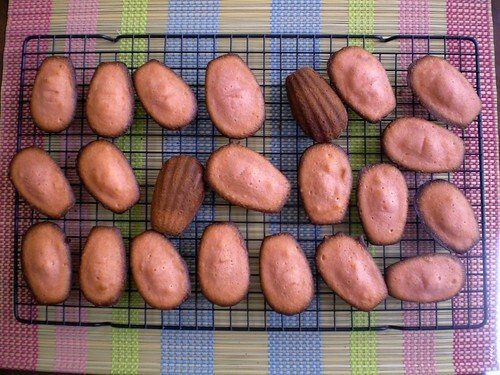 Strawberry Madeleines Adapted from Bon Appétit. Melt butter and set aside to cool. Beat eggs and sugar in a large bowl with an electric mixer till blended. Beat in vanilla, jam, and salt. 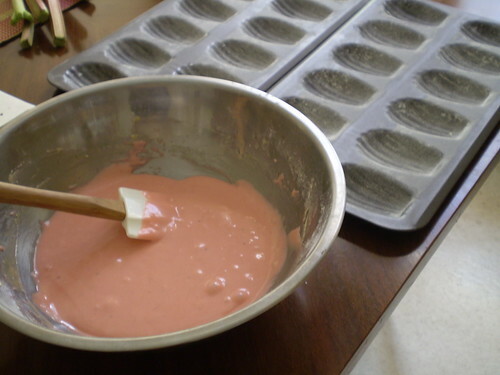 Beat in food coloring if using till batter is desired color. Add flour and beat until just blended. Spoon one tablespoon of batter into each cake shell. Bake until puffed and edges are lightly golden, about 12-15 minutes. Cool in pan for 5 minutes, then remove from the pan and finishing cooling on a wire rack.